- Cartoon Cute Flowerpot: Minature flower pot.Great for mini succulents and cacti or decorative candles. 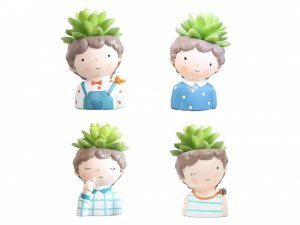 - Creative Gift Decor: Creative Boy shaped flowerpot, cute and interesting gifts for boy friend, girl friend birthday, Christmas Parties. - Tidy Save Space: With Drainage Hole and stopper on the bottom, a stylish decor for your windowsill, desktop, home and office decoration. Handmade Distinctive: High quality resin succulent planter, not fade, unique attractive design. Size:3.14*2.95*4.1 inches(L x W x H), plant not included. - Satisfaction Guarentee: We offer life time warranty, if there are any quality problem, please contact us, send your order number and take some photos of the product to us, we will provide a replacement to you ASAP.